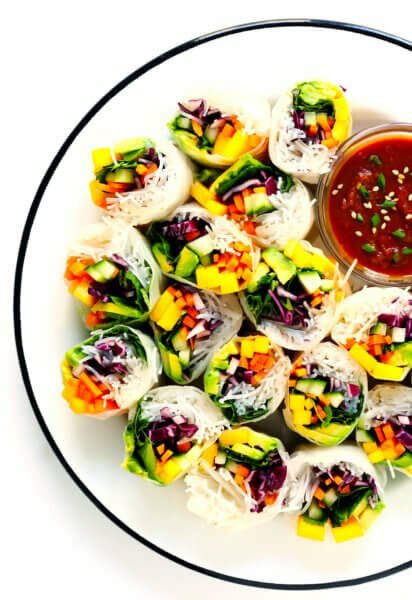 Pingback: Fabulous Father's Day appetizers - is this REALLY my life? | is this REALLY my life? 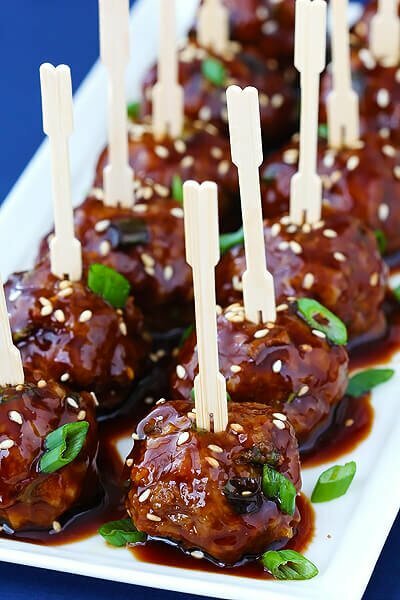 I made these for a party at my son’s house – Smaller, bite sized meatballs and they were a total hit! The meatballs are good, but the sauce is overpowering — way too much hoisin sauce and very, very salty. I was very glad I put the sauce on the side because everyone pretty much either ignored it or threw it out. These were delicious!! I make them with vensison and they are a HUGE hit! 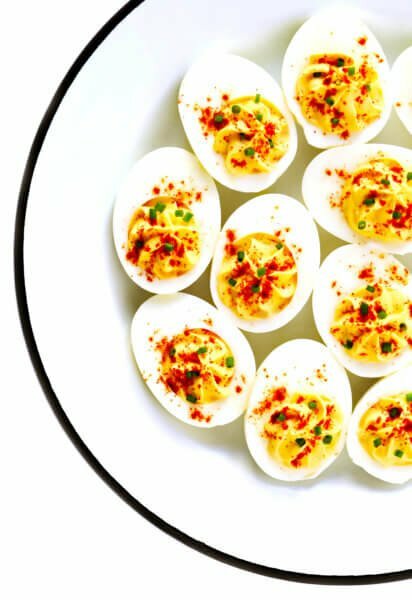 Pingback: Unique Party Ideas from Bellenza | Holiday Food and Drinks: Tips for Planning Your Holiday Menu! Sorry for the confusion with Pinterest. The ingredient list is an automatic feature with Pinterest that I cannot edit, but I’m sorry that they made the directions confusing. Best wishes if you try the recipe again. It really is one of my favorites! these are really fabulous . I have made them many times and everyone loved them. I am sorry that the other person had to comment on here negatively . when it wasn’t ALi who was at fault for the outcome of their meatballs. 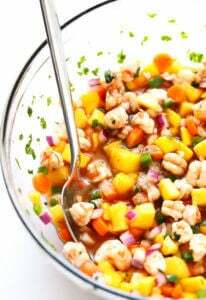 Bravo Ali and thank you for sharing this great recipe! Happy Holidays to you all !! I know sometimes recipes are hard to follow but I personally thought it was very self explainitary it was written in two sections each one labeled accordingly. In all fairness to Ali I thought it was very easy to understand, I don’t mean this comment in a bad way but I am sure this wasn’t meant to make you have a frustrating Christmas. The sauce was terrible. Couldn’t eat them. I made these for New Years and they were a big hit! I changed up the meatballs by adding a bit more ground beef (didn’t want to waste my open package.) Added more sesame oil and garlic, but only had 3 green onions which was enough. For the sauce, I reduced the hoisin to 1/3 cup and halved the amount of ginger and it was great! I think fresh ginger would work great here. I paired the sauce with my vegetarian meatballs and it was perfect :) Oh, and 12 minutes was the perfect amount of time for my meatballs (I measured them out by the tablespoonful.) Thanks! Made these for dinner tonight. . . Amazing! LOVE these! Hi, I am bringing meatballs to a baby shower on Sunday, do you think I can make them in a crockpot? 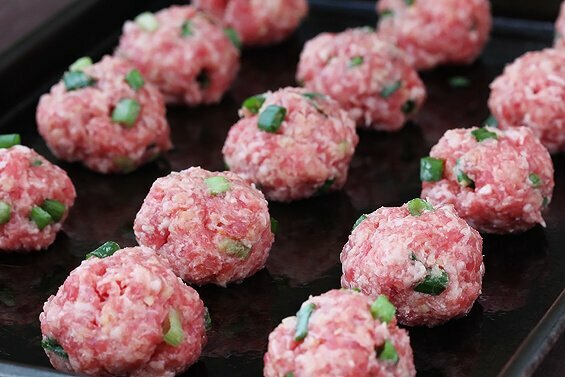 I have frozen meatballs which I never ever use, but due to a huge lack of time I gave in and bought premade meat balls!! If I add fresh ginger and garlic to the pot and a little brown sugar and the orange juice and lime juice I think it will be alright? What do you think!! I am excited to try this recipe the real way, but for now I have to improvise!! Sorry for the late reply — I must have missed this comment! The details you suggested sound like they will definitely help flavor the frozen meatballs, and a crock pot has worked well for me in the past. Hope you enjoyed them! 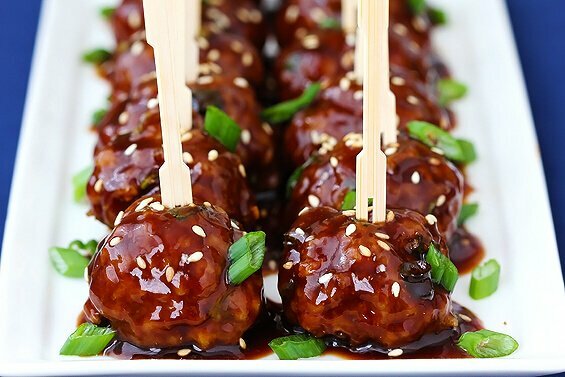 Good recipe…definitely need salt in the balls and I added a small amount of brown sugar and chili garlic sauce to bring the sauce around. These are delicious! I made a variation for my husband and he keeps asking for more. I used ground turkey and gluten-free breadcrumbs because that is what I had in the fridge/pantry. Your sauce recipe isn’t that much different than for homemade hoisin sauce, so I just made that. I served it all up with steamed veggies. There were sweet potatoes and a soft head of lettuce in the farm box this week, so I think I will try these as lettuce wraps and serve with a side of mashed sweet/golden potatoes and garlic carrots. Where can I find the little picks you show with the meatballs? I bought mine at World Market, but they are also available on Amazon. I made these for a motorcycle club meeting and put them inside wonton wrappers so it would be easier for them to carry around. THEY LOVED THEM!! And have been requested for the next one! Very delicious. Now, my wife and my daughter, appreciate my cook’s talents. Thank you and excuse I for the faults. I’m a french canadian and I don’t master English. Good day! Pingback: oscar appetizers. | A Whole New World. A new favorite in our house! It has the seal of approval from 5 kids (2 – 10yrs) and my husband. Thanks for sharing this recipe. It will be made again!! Family member is allergic to eggs so swapped it out for milk. Tasted fantastic! Added your fried rice to the dinner and it perfect as well. Tried your recipe tonight fantastic and easily prepared♡♥ looking forward to many more thank you :) all the best TT. I’ve made them in 3 different ovens too, so I know it’s not the oven. Haven’t tried it with pork yet, so that might be it, otherwise is there something I’m missing?